Punjab Public Service Commission (PPSC), Lahore has announced New Jobs in Different Department of Government of the Punjab. Candidates who are waiting to apply for PPSC Jobs 2018 can apply for Public Service Commission Jobs 2018. Punjab Public Service (PPSC) is a leading Punjab Government Testing Agency which conducts Different Recruitment Tests and select Energetic, Experienced and qualified personnel for Punjab Government Departments. Now it has announced New Vacancies in Provincial Disaster Management Authority, Board of Revenue, Specialized Health Care and Medical Education Department. Candidates who meet the required Criteria may apply online by visiting Punjab Public Service Commission Website for the post of Computer Operator on Regular Basis and Assistant Professor (Paediatric, Haematology, and Oncology). By hand submitted application will not be entertained. Candidates are directed to fill their Application Form online correctly, in Case any Error Punjab Public Service Commission will not be responsible. 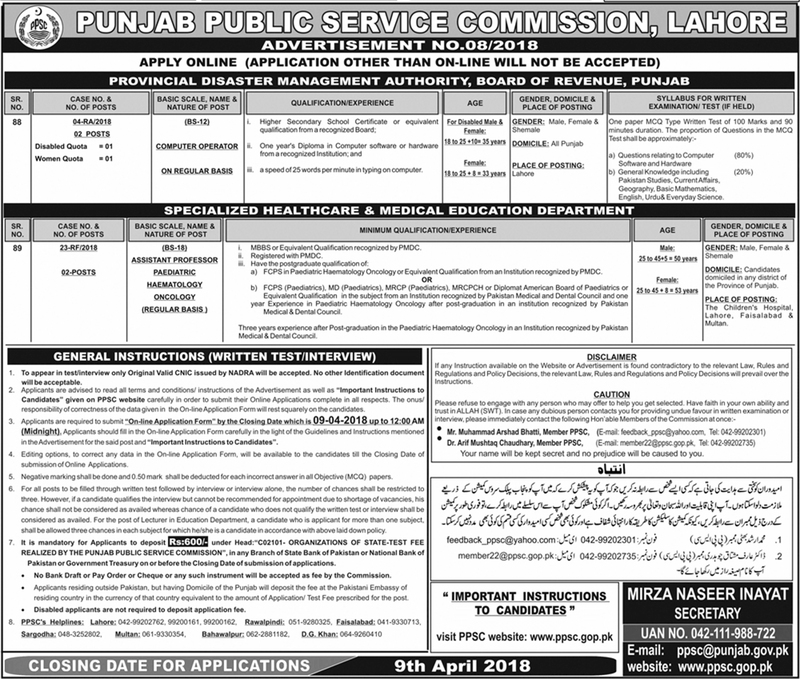 Punjab Public Service Commission (PPSC) New Jobs Daily Jang Newspaper 26 March 2018.